Choose from four colors-Charcoal Black, Cobalt Blue, Punch Red, and Sandstone White. Discover great reads and Kindle exclusives. Prime members get unlimited access to over a thousand books, magazines, and more. Kindle Unlimited offers over 1 million titles and thousands of audiobooks. With Whispersync, switch from Kindle to the Kindle app without losing your place (requires Wi-Fi). With Audible, Kindle lets you switch seamlessly between reading and listening via Bluetooth-enabled speakers or headphones. Kindle devices don’t support Immersion Reading, which lets you listen and read along as the text highlights. To see devices that do support Immersion Reading, click here. For background information, I am a professor and a tech geek. I have used Kindle e-readers for around eight years now. I also own 4 of them (3 Kindle Touches and 1 Kindle Paperwhite 3rd generation) in addition to two Kindle fires (Kindle 7 and Kindle 8). Below is my summary of the “all-new Kindle” (Kindle 10th generation). I have spent the past few days playing around with the Kindle, reading from it, and reading other online reviews about this version to ensure the comprehensiveness and accuracy of information provided in this review. For reference purposes, this Kindle model was last refreshed in 2016. 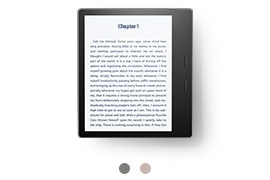 This model is the lowest-end basic flagship model of the Kindle e-reader. 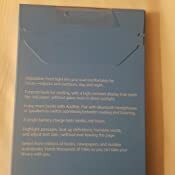 THE BOX: The Kindle device, a quick-start guide, and a USB cord. The item arrived sealed well. Please note that Amazon does not provide a wall adapter. Also, the Kindle box is smaller than the Paperwhite box. Availability: Black and White are the base colors variants. Additionally, Kindle fabric covers can be purchased for $29.99 in 4 different colors: Charcoal Black, Cobalt Blue, Punch Red, and Sandstone White from Amazon. I wouldn’t recommend these overpriced covers. There are several other quality and aesthetically pleasing covers that can be found on Amazon that are affordable, well rated, and function better. - An adjustable backlight composed of 4 LEDs that helps readers with reading both indoors and outdoors. I love this feature. This feature alone justifies the additional $10 price increase in my opinion. - Latest e-ink technology for better contrast that helps makes the text crisper. The text is crisper than prior version (see images) but not as crisp as higher end models. - Option to hear Audible books through Bluetooth headphones or speakers. - Warranty remains the same: 1-year limited warranty and service along with product purchase. An additional warranty should be separately purchased if deemed necessary. - Size: 6.3” x 4.5” x 0.34” (160 x 113 x 8.7 mm). As compared to the prior model, there is a 2mm reduction in width and 4 mm reduction in depth/height). 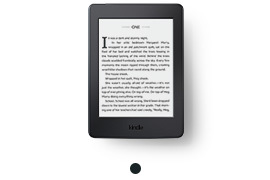 - Weight: 6.1 oz (As compared to prior Kindle 8, there is a 0.4 oz increase in weight). - Water resistance: Kindle has no IPX8-rating (basically not water-resistant) while Kindle Paperwhite has the IPX8-rating (i.e., it allows submersion in 2 meters of fresh water for up to one hour). Display size: remains the same (6 inches). -Total size: Even though the display size (previously mentioned) remains the same the specs of the items are different. 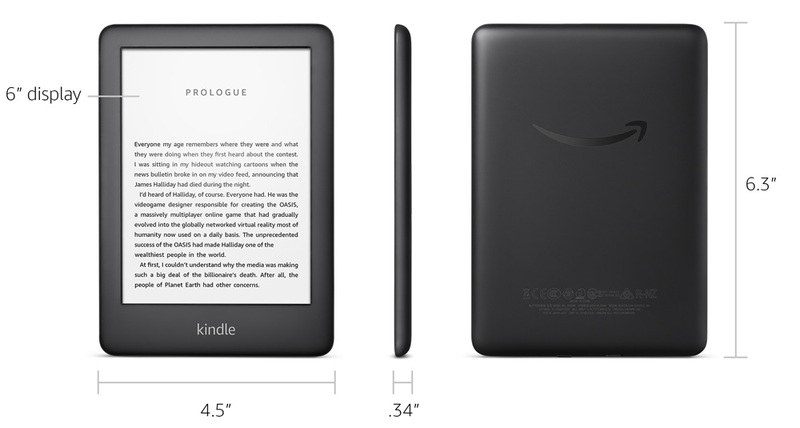 Kindle: 10 6.3” x 4.5” x 0.34” (160 x 113 x 8.7 mm) while Kindle Paperwhite: 6.6” x 4.6” x 0.3” (167 x 116 x 8.18 mm). - Weight: Kindle 10 weighs 6.1 oz while Kindle Paperwhite Wi-Fi: 6.4 oz (182 g) Wi-Fi + Free Cellular Connectivity: 6.8 oz (191 g). I have refrained from comparing the Kindle Oasis in this review with the Kindle 10 because it is the highest-end model and if a consumer is looking at this model, then it is highly unlikely they are considering the Kindle Oasis. Besides, the Kindle Oasis costs around 3 times the amount of the Kindle 10 and 2 times the cost of the Kindle Paperwhite. Consequently, it would not be a fair and/or necessary comparison for this review. - Accessibility features: VoiceView screen reader (works through Bluetooth audio) and provides directions to help visually impaired readers to navigate through the device and read books with text-to-speech (this feature is only available in the English language). 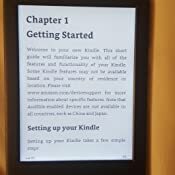 Additionally, to help visually impaired readers, Kindle also includes the ability to adjust the font size, font face, line spacing, and margins. - Smart Lookup (quickly check the default dictionary). The default, New Oxford American Dictionary and Oxford Dictionary of English (both from Oxford University Press). - Supports the following content formats: Kindle Format 8 (AZW3), Kindle (AZW), TXT, PDF, unprotected MOBI, PRC natively; HTML DOC, DOCX, JPEG, GIF, PNG, PMP through conversion; Audible audio format (AAX). - Users can review Wikipedia to understand word meanings better. - Integration with Goodreads (Amazon-owned book database). - Pdf and word documents can be sent to Kindle through email after a Kindle-specific email address is created. - Provides the option to share word or texts and additional commentary by the user. - Add a note regarding the word. - Translate a word from English to 16 languages. - X-Ray tool, which provides detailed information on key content in the book (i.e. “bones of the book”). Wi-Fi: I was able to connect to the Wi-Fi network and use the experiential browser without any technical difficulties. The process was pretty straightforward. 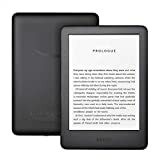 - The initial purchase with a promo discount entitles you to a free 3-month Kindle Unlimited subscription ($29.97 value). After 3-months subscription will auto-renew at $9.99 (this promo discount can be taken out at any point in time). This makes this purchase a worthwhile purchase with additional savings. - The cost for the Kindle will be $109.99 (without special offers). Customers can also disable special offers later by paying $20 if they purchase the Kindle with special offers ($89). Personally, I would recommend going the route of getting the special offers and then disabling it. The special offers only appear when the Kindle is locked/asleep and are non-intrusive. I have 6 kindles all of which have special offers and have never had an issue. However, if the user does not like the special offers, you can purchase the $89 kindle and then remove the special offers (which might probably end up saving you a few dollars because there are no taxes for disabling offers). 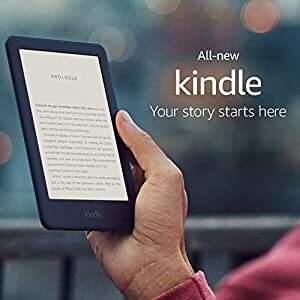 - Customers should also know that they can easily trade-in their prior Kindle for Amazon gift cards ($5-$25) and also receive a 25% discount towards their new Kindle. - My recommendation would be to purchase this item during a sale event (for instance, Amazon Prime day is coming up in July). The customer can get around $30 off, and then stack the trade-in and the 25% discount to get this item for a minimal cost (maybe you can snag it for $30-$40 if everything is applied correctly). However, one thing to keep in mind is that Amazon might decide to remove the trade-in gift card and 25% discount at any point. To sum up, my review, this is the base version of the Kindle. No bells and whistles, but it does the job. I absolutely love the Kindle LEDs in this model. It makes a world of difference for night reading specifically when my family is in bed, and I don’t have to get up to turn on/off the house lamp and make a ton of noise. The bottom line is that the Kindle e-readers are incontestably the best e-readers currently in the market. This Kindle follows in the same trajectory as prior versions. I would personally recommend the Kindle Paperwhite (mid-tier model) as opposed to this Kindle 10 (the model reviewed) for a few more dollars. This can be purchased after following the cost-saving suggestions previously listed. My reasons are several other features like higher resolution (300 PPI vs. 167 PPI), more LEDs (5 vs. 4), Water resistance (IPX-8 rating), larger storage (8 or 32 GB), and Cellular option for higher-end models will give the edge for customers looking for more options. However, this model does well for a base entry model. After additional testing, I have given the Kindle 10, 5/5 stars in my review (instead of the initial 4/5 stars). I did consider docking down ½ a star for no increase of PPI for this version (167 PPI). However, please note that the e-ink quality has significantly improved and the LEDs make a world of difference, so this is Kindle is much better (factoring in reader comfort and quality) than the prior Kindle model even though both have the same PPI. Besides, this is the base version. What more can one expect for $89? Additionally, please note that the PPI is not a big issue for those that don’t regularly use the device for reviewing images, graphs, pictures, manga, illustrations, etc. 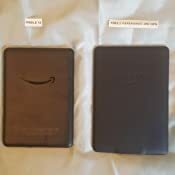 Please review my picture (uploaded) comparison between text of the Kindle Paperwhite 3rd gen and Kindle 10 for comparison purposes. It is hard to see any distinction on a cursory observation. Please note that any more updates will be posted after further testing if deemed necessary. 1.0 out of 5 starsLower ppi - Not good. 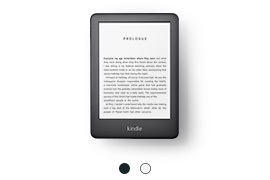 I wouldn't purchase this product for the following reason: my 3rd Gen. Kindle has 300 ppi and this supposed "new" one has only 167 ppi so what gives? The pros: I like that you have a choice of colors and that it comes with a front light. It's small and easy to carry around. If you've never had a Kindle before or never had one higher than the base, you won't notice the 167 ppi difference between it and the Paperwhite and the Oasis. The cons: If, however, you're like me and you have an Oasis, you'll immediately notice how much less crisp the letters and pictures are. Don't get me wrong. It's a good price for a starter Kindle, especially with lights now. For someone who's looking for the best reading experience they can get without spending too much money, it's a good choice. However, for a few dollars more, they can get a Paperwhite with better resolution, waterproofing, and more storage (2x more for the base Paperwhite model). So what should you get? If you're more concerned with saving money, go for the Kindle Basic. Otherwise, about thirty dollars more gets you a big improvement. I had a Kindle touch years ago and had stopped using it. But I want to be able to focus on reading and not pop-ups from other apps so I bought this new Kindle to avoid the distractions of reading on my phone. The device is smaller than both my original Kindle touch and my husband's Kindle Paperwhite. 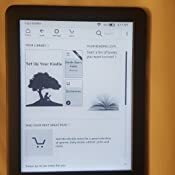 I was able to quickly get connect to the internet and begin downloading Kindle books I checked out via Overdrive. The device can be held in one hand comfortably, and it's lightweight enough to feel quite portable without appearing flimsy. This Kindle has some buggy-feeling holdovers from previous generations: occasional leftover pixels during page/screen pages. However, I find the touch screen to be responsive without being jumpy. The bottom/power button sometimes takes an extra push to activate, or perhaps just needs me to focus a bit more. I don't mind the "special offers" and generally ignore them completely, yes, this is a generally annoying feature, but I'd rather spend that $20 on books. The backlight can be adjusted to read outdoors or in your bedroom in the dark (handy if your partner nags about keeping a booklight on). Another reviewer commented on the PPI. Personally, as I don't use the device for pictures/illustrations/detailed charts, I frankly don't care. The images that appear in the special offers are clear enough, and the default sized print is crisp and clean and I have no issues reading without my glasses. If you frequently read books that are illustration/graphic-heavy, you may prefer a Paperwhite or other device. I'll adjust my review if my sentiments change but for now I am very happy with my new Kindle. 4.0 out of 5 starsNot too bad! I've been reading on this for a few days now. It's a little bit smaller than my regular Paperwhite, but the size doesn't bother me none. I like the smaller size. I purchased it without special offers as I don't need to see all of that. I'm an avid reader and read A LOT. I haven't noticed a difference in battery life between this and my Paperwhite. I have to charge that one daily too. As I said, I read A LOT. The front lighting is awesome. I love that. Comparing this one with my Paperwhite together with all the settings set all the same, this one is a little brighter. The only complaint I have is that when I touch the screen to change the page, I end up having to touch it twice to get the page to turn. I'm hoping an upgrade will fix this. All in all I do like this one a lot. It isn't perfect, but I do like it. Don't buy into the petty negative reviews. The improvements to the basic Kindle are great! I've been reading on mine the past several days and I'm extremely impressed. The lighting is the brightest, whitest and most even I've seen. It's comfortable to hold, easy to read, and just as responsive as my Oasis and my husband's Paperwhite. Highly recommend!